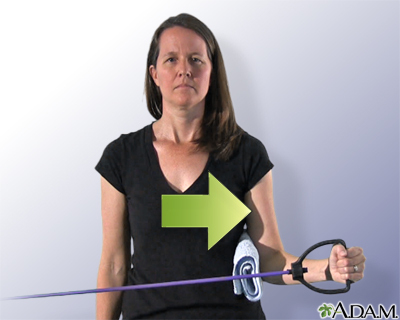 External rotation with a band is an exercise that strengthens or tones the muscles that help rotate your shoulder outward, or away from your body. Reviewed By: Physical Therapist Tracy Ann Wright, Roswell, Georgia. Also reviewed by David Zieve, MD, MHA, Medical Director, A.D.A.M., Inc.